Norgorber (pronounced NOR-gore-ber) is known as a deity of thievery and assassination, as well as a keeper of secrets. He is called the 'Reaper of the Reputation' by some, but he has more insidious titles among his other worshipers. He remains an enigma to most, and his true motives are unknown. Many of his own followers remain ignorant of his plans and designs. Norgorber is the only evil aligned ascended god. 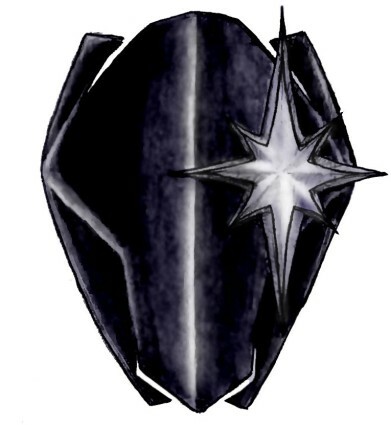 Norgorber's past before he ascended into godhood through the Test of the Starstone, is unknown. His followers go to great lengths to keep it a secret. Some believe that if the origin of the god became known, the god himself would become undone. Norgorber attempts to stay neutral in dealings with other gods. 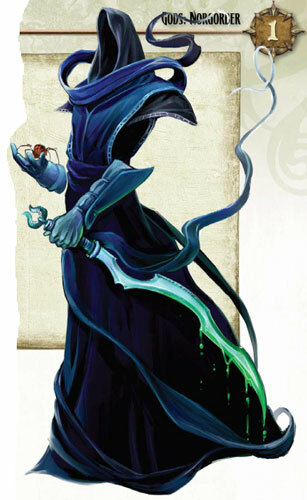 Abadar, Cayden Cailean, Erastil, Iomedae, Sarenrae, and Torag view him with disdain and will have little to do with him. A deceptive deity, he has been known to aid those who do not support his ideals as long as the benefit is mutual to his own ends. Norgorber manifests as what appears to be an ordinary human male dressed in brown and black clothing. However, his face is always either partially or completely obscured. Norgorber's herald is the Stabbing Beast, a gigantic black scorpion entity that also takes the form of a darkly armored humanoid with a scorpion-like tail. Worshipers of Norgorber are considered cultists by nearly all inhabitants of Alhara. The cult is forbidden nearly every nation except Tarsis, where it is tolerated. The cult is split into four parts, each one focusing on a specific aspect and paying little attention to others. His followers wear masks to identify themselves, and as a symbol of their devotion to the god. Some worshippers wear different masks in order to signify different emotions or signals. The masks themselves are often elaborate, with hinged jaws and coloured lenses. Norgorber's worshipers come from all walks of life. Many are clerics, rogues, bards and assassins. The most extreme are numbered among the murderous insane, who commit atrocities in his reverence. The followers of the cult of 'Father Skinsaw' are known as the Skinsaw Men. Spies and politically minded folk who worship him as the Reaper of Reputation consider him the deity of secret knowledge. Thieves revere the 'Gray Master'. Assassins, alchemists and herbalists follow 'Blackfingers'. Norgorber's ceremonial colours are black and brown. The cultist's clothes usually follow modern fashions, in order to blend in wherever they are. Outwardly, the temples of Norgorber are more akin to a thieves' or merchant's guild than a religious site. Their true nature is usually hidden, transformed during the night to be obvious to the faithful. The temples are managed by a guildmaster with several underlings under a military or business like chain of command.